Do you have a pink skinned and white haired dog or cat? 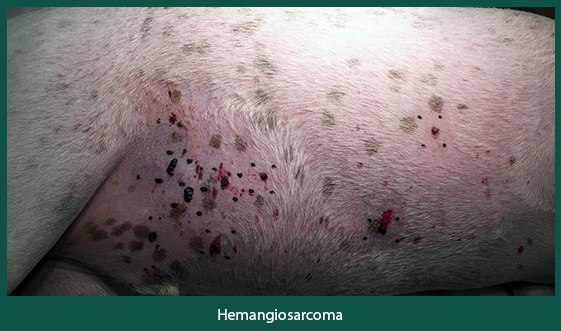 You may want to read about Solar Induced Hemangiosarcoma! Solar Induced Hemangiosarcoma is a malignant cancer of the cells that line blood vessels (veins and arteries) and often involves the skin. Solar damage (sun bathing) can cause these changes on the abdomen of pink skinned and white haired dogs (especially whippets, Italian greyhounds, Beagles, Great Danes, and English Bulldogs), and on the head and ears of white cats. Nodules range in color from bluish to reddish-black plaques or nodules (bumps) <4cm. They can also present as poorly defined, spongy, dark red to black masses that measure up to 10cm in diameter. Hair loss, bleeding, and ulceration are common. A dermatologist will put together all the clues from history and physical exam. A biopsy (a minor surgical procedure done with sedation to remove small pieces of skin, leaving a few stitches in the skin) of the affected skin would be the definitive way to make the diagnosis. Surgical excision of all present nodules that are limited to the skin. However, those nodules that are a bit deeper will require surgical excision and chemotherapy from a Veterinary Oncologist. The prognosis is good for superficial tumors; however, the prognosis for deeper nodules is poor due to recurrence and spreading to other structures beside the skin. Prevent pink skin/white haired dogs from sun bathing. Apply a canine specific sunscreen (at least 30 SPF) to the skin daily. Clothe your pink skinned/white haired dog in a sun protective suite daily. The best prevention is to keep light-skinned dogs inside during the day, and only walk them early in the morning or late in the evening to avoid peak sunlight hours. Contact our clinic if you think your pet is a sun bather or has skin changes similar to the photo posted above.